Brian W. Blakley, M.D., Ph.D., is the director of the Dizziness Clinic at Wayne State University Medical Center. He specializes in the diagnosis and treatment of diseases of the ear. Mary-Ellen Siegel, M.S.W., is a lecturer in the Department of Community Medicine (Social Work) at the Mount Sinai School of Medicine in New York City. A psychotherapist in private practice, she is the author of several books on health, including The Cancer Patient's Handbook. 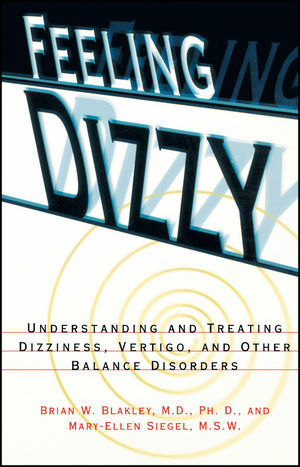 PART I: Dizziness: What Does it Mean? 3. Finding the Cause of Dizziness and Vertigo. PART II: The Causes of Dizziness. Labyrinthitis and Other Ear Infections. 5. Central and Vascular Vestibular Disorders. Disorders of the Blood Supply. Connective Tissue and Arthritic Problems. PART III: Treatment for Dizziness. 8. Medical, Dietetic, and Surgical Treatments. Physical Therapy Exercises You Can Do at Home. Future Hope for Chronic Dizziness.